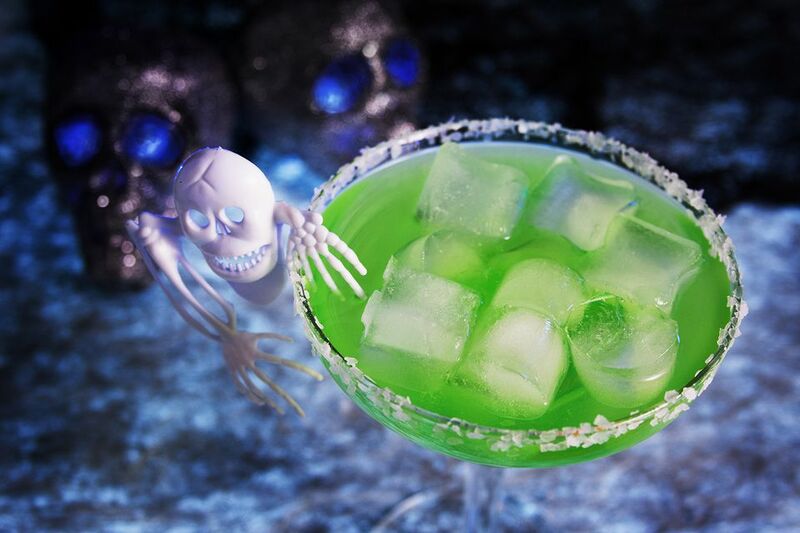 The skeletons in your closet recipe is a fruit-filled margarita served on the rocks. It may be a bit kitschy, but that's what makes it a perfect Halloween cocktail. Inside the glowing green drink, you'll find tequila flavored with tropical fruits, including mango and pineapple. It's simple, fun, and easy to shake up. The recipe was created by Marvin Allen from New Orleans' Hotel Monteleone for Hornitos Tequila to feature the brand's Plata (silver or blanco) tequila. It plays off the color theory that yellow and blue makes green. The blue color comes from DeKuyper's Island Punch Pucker, a tropical fruit flavored schnapps that has the Pucker line's signature tart kick. Pineapple and mango juices form the yellow liquid and complete not only the cocktail's look but also its blend of fruity flavor. Pour the tequila, schnapps, and pineapple and mango juices into a cocktail shaker filled with ice. Strain over fresh ice into the prepared margarita glass. Originally, this recipe called for DeKuyper Island Blue Schnapps, which, most likely, has been rebranded as Island Punch Pucker (the formula may have changed with the label). Both iterations are super sweet, very sour, bright blue schnapps flavored with tropical fruits. Rather than let labels confuse you, pick up whatever blue version of schnapps DeKuyper is offering at the moment. Other brands of liqueurs will work as a substitute. The two key points to look for are the blue color and tropical fruit flavor. This is one margarita that you'll most likely want to serve on the rocks. The ice will mellow out the tart flavors and help marry the fruits as you drink. This recipe is a great option for a frozen margarita. Quickly chop about 1 cup of ice (5 to 6 cubes) in the blender, add the drink ingredients, and blend it up. You may enjoy this drink even more with blue curaçao rather than a blue schnapps. Its orange flavor will mix perfectly with the pineapple and mango, you'll get the same green color, and it's very easy to find. How Strong Is a Skeletons in Your Closet Margarita? This margarita is surprisingly light and a lot of that is due to the juices. When made with the suggested brands of liquor, the drink's alcohol content is just 15 percent ABV (30 proof). In this case, its fruity punch is definitely much stronger than its bite!